It was not my own idea to study with him. Back in 1998, my pre-college teacher Gisella Bergman suggested I check out this charismatic Austrian professor for my Bachelors Degree. Docile as I still was in those days, I decided to audition for him, and immediately knew he was the right choice; I went on to study with him for three years, graduating in 2001. Ferdinand managed to be inspirational with a single gesture, a witty expression, one of his famous winks, or just a perfectly delivered musical character. Even the Stamitz concerto, often considered a ‘necessary evil’ in the viola repertoire, was unforgettable when taught by Ferdinand. And then there was the wonderful Viennese charm he would give to Schubert’s Arpeggione Sonata – this is where the unique style of one of his own teachers, Amadeus Quartet violist Peter Schidlof, would peek around the corner and give me a whole new perspective. Needless to say, I flourished as Ferdinand’s student, and was always eager for the next lesson. 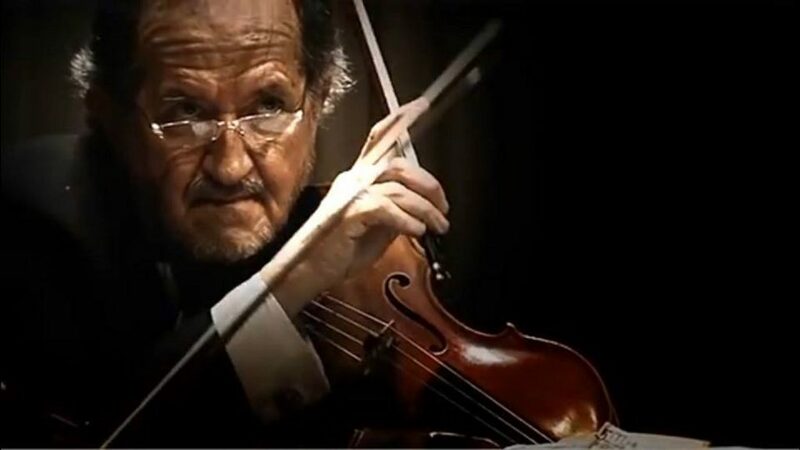 From those early years I vividly remember hearing Ferdinand in concert as well, particularly as the guest player in Dvorak’s Viola Quintet with the Prazak Quartet, a part he later played several times with my own Rubens Quartet. Also memorable were all the times I heard his warm and gentle voice from the heart of the Parkanyi Quartet, in particular in those pieces we shared a special love for, like the early Schubert B-flat quartet. Playing chamber music, which would become my career, was a seed planted carefully and lovingly by Ferdinand – not strictly in a teacher role, but rather through his overall personality, inside and outside music. I was fortunate to share the stage with him on several occasions through the years, and I learned more than I can say. Generations of students from all over the world have benefited from his priceless chamber music coachings. I personally will always associate the Dvorak quintet with the memory of rehearsing it in Ferdinand’s living room, while his son Hans was building a toy railroad around the ensemble. Ferdinand loved music dearly, but it wasn’t his only passion. He loved life in a broad sense, had very fine taste, and a nose for quality (but not posh) food, coffee, furniture and antiques. This is probably the root of his second (and eventually primary) career as a Persian carpet dealer. Those of us who mistook this for some kind of funny hobby were quickly persuaded otherwise. Ferdinand was well-respected in the business, thanks to a combination of solid expertise and healthy sales instincts. (These instincts once came in very handy for me when I called him for help with a crooked bow dealer, but that is a whole different story…) It made me smile to see new, tasteful additions to the interior of his Hilversum home, every time I visited, varying from carpets and antique Portugese tiles to a ramshackle harmonium that he just couldn’t not buy. Ferdinand didn’t need to be reminded to love life, even when he must have known his days were coming to an end. Sadly, Ferdinand had been ill for a very long time. When we spoke, he wouldn’t elaborate, as if he didn’t want to burden me with his condition. But it was painful to see him slowly saying goodbye. Dear Ferdinand, I owe you more than I can express in words. Your radiant artistry, sense of humor and joie-de-vivre have shaped and defined me as a musician and human being, and I am incredibly grateful for that gift. What a classy guy you were. Rest in peace. This entry was posted in Nieuws by DVS. Bookmark the permalink.